WASHINGTON — The Senate on Tuesday confirmed Deputy White House chief of staff Kirstjen Nielsen as President Trump's choice to lead the Department of Homeland Security. Senators approved Nielsen's nomination, 62-37, on Tuesday. Nielsen, 45, is a former DHS official who is considered a protege of White House Chief of Staff John Kelly, a former DHS secretary. Senate Majority Mitch McConnell, R-Ky., called Nielsen a qualified candidate with the talent and experience to succeed. As a former DHS chief of staff, Nielsen understands the department's daily operations and is ready to lead on her first day, McConnell said. Democrats complained that Nielsen lacks the experience needed to run a major agency with 240,000 employees. They also cited concerns about possible White House interference in a recent DHS decision to send home thousands of Nicaraguans and Haitians long granted U.S. protection. Homeland Security oversees the nation's borders, cybersecurity and response to natural disasters, among other areas. "Ms. Nielsen is a homeland security expert with a deep understanding of the issues facing the Department and is well-positioned to lead us into the future," Acting Secretary of Homeland Security Elaine Duke said in a statement Tuesday. "It has been an honor to serve as the Department's Acting Secretary, and I look forward to working alongside Ms. Nielsen as her deputy as we continue to carry out the DHS mission of safeguarding the American people, our homeland, and our values." Senate Homeland Security Chairman Ron Johnson, R-Wis., said Nielsen brings valuable, practical experience to DHS. He called her an expert in risk management, with a focus on cybersecurity, emergency management and critical infrastructure. Nielsen "is ready to answer this call to duty," Johnson said. "She has been working in and around the Department of Homeland Security since its creation." Sen. Kamala Harris, D-Calif., said Nielsen has played a role in several questionable Trump administration decisions, including a travel ban to restrict entry from six mostly Muslim countries, termination of a program for young immigrants and what Harris called a "feeble response to Hurricanes Irma, Maria and Harvey." Frank Sharry, executive director of America's Voice Education Fund, which promotes immigrants' rights, said Mr. Trump has worked to punish immigrants and refugees, from his call to build a wall along the Mexican border to the partial travel ban to raids against immigrants. As a key Kelly aide, Nielsen is "one of the architects" of Mr. Trump's immigration policies, Sharry said. He called Nielsen "a willing accomplice, helping to shape and implement this profoundly disturbing and un-American vision of our country." Nielsen said at her confirmation hearing last month that climate change is a crucial issue and said the Trump administration is revising its climate models to better respond to rising sea levels. "I can't unequivocally state it's caused by humans," she said. "There are many contributions to it." 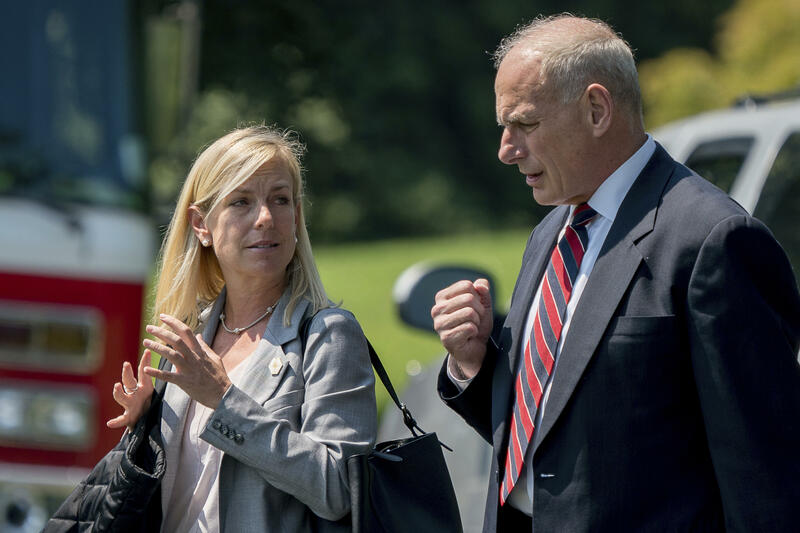 On other topics, Nielsen said she agreed with Kelly that a U.S.-Mexico border wall is unlikely to be a physical barrier from "sea to shining sea." She also condemned white nationalism, rejected Islamophobia and promised to make cybersecurity a top priority. Mr. Trump repeatedly promised during the campaign that he would build the wall and that Mexico would pay for it, but the administration is seeking billions in taxpayer dollars to finance the project. Homeland Security has been leading the charge on implementing Mr. Trump's aggressive immigration agenda, and Nielsen pledged to continue that work. Nielsen will be sworn-in in the coming days.